Until this year I didn’t really ‘get’ the hype about gin. As a drink it wasn’t something I would ever have ordered in a bar or whilst out for a meal. 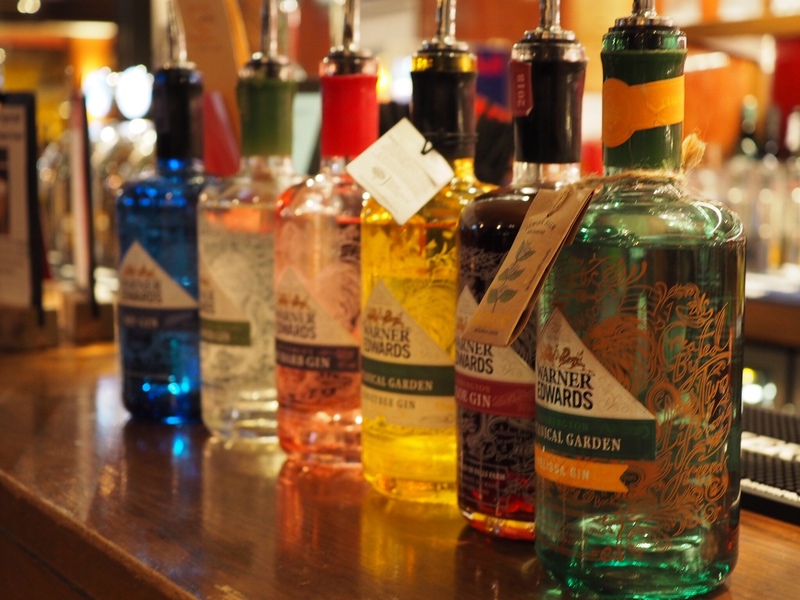 Over the summer I attended a couple of gin tasting events and was completely converted. I even bought myself some pink gin and lemonade to enjoy at home out in the garden. Then autumn rolled around and I wasn’t really sure if pink gin had a place in the colder months. This week I was invited along to a gin tasting with Warner Edwards at Banana Wharf in Poole Harbour. The restaurant has a special place in my heart as it is where Ed proposed to me three years ago and we have enjoyed many a family meal there as my cousin works at the venue. I will admit, I hadn’t heard of the brand Warner Edwards before the night but I was really impressed by the knowledge of Southern Territory Manager Ben, who was running the event. Warner Edwards are based in Harrington, Northamptonshire and started up six years ago when Tom Warner found himself at a loss for what to do with the family run farm out of season. It was interesting to hear the back story of the brand and how the gin has changed and adapted to include different varieties over the years. The bottles are totally instagram-able, with strong branding and pretty emerald colours. There is even a hidden message written in script around the bottle and each variety of gin has a story behind it. I think the most impressive was the Honeybee Gin, with profits from each sale going to the work at the Royal Horticultural Society (RHS). The bottles have a packet of wildflower seeds attached to them for you to plant bee-friendly botanicals at home, and it was clear from Ben’s speech that the company are passionate about saving the bees. The evening had started with a glass of gin and tonic and we were provided with tots of each gin to add mixers and garnishes to as the night went on. By the end I was starting to feel more than a little tipsy, especially as I was getting the majority of Ed’s as well as he was designated driver for the evening. I think my favourite was the Rhubarb Gin (no surprise there as it is similar to my pink gin in taste) but I also liked the Melissa Gin and the Sloe Gin, which was a completely different experience for me as I had never tried a sloe gin before. Canapés were brought out, prepared by Banana Wharf’s resident chef and beautiful presented for us, and I absolutely loved the croquette with tabasco sauce and salsa – it was delicious. At the end of the event we were treated with a gin cocktail which tasted gorgeous. I will definitely be trying one out again on our next visit to Banana Wharf as it was just the right level of bitter and sweet. Banana Wharf Poole Harbour have a whole host of events coming up over the coming months including gin tasting and much more. Follow them on social media to keep up with their events – Facebook, Instagram & Twitter. We were invited along to Banana Wharf for the Warner Edwards Gin Event on a complimentary basis, however all words and images are my own.